At least five orca whales have been seen in the Clyde over the last few days. Christopher Denovan was the first to spot them, encountering these amazing animals whilst out in his motor boat at 7.30 this morning, just off Wemyss Bay Ferry Terminal. Since then, further reports have come in from passengers on board Western Ferries this afternoon, who operate between Hunter’s Quay, Dunoon and McInroy’s Point, Gourock. HWDT was alerted to these unique sightings through social media, as the videos of the killer whales are shared far and wide. We would like to encourage everyone who encounters these animals to upload details of their sightings to Whale Track, enabling to us to track their movements, and learn more about the group. Whale Track is freely available from both Google Play and the App Store, or alternatively submit your sighting online. From Chris’s videos you can see that the whales were very active this morning, displaying a number of different behaviours. Initially the group were seen fast swimming, in small groups; however they soon slowed down and looked to be foraging for food. Spy hopping is a behaviour where the animals come up out of the water vertically, raising their heads above the surface of the water to look around, before going back down. This behaviour is interesting, as it is not frequently reported on the west coast. 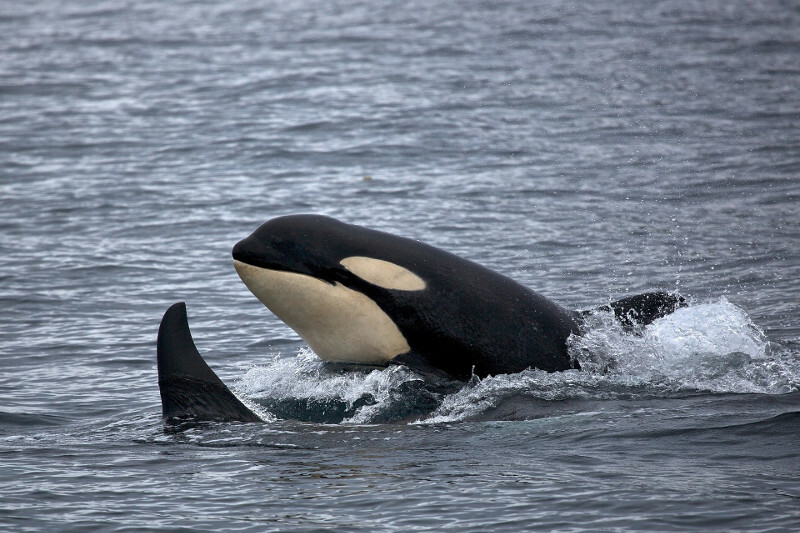 At present time, the identities of these killer whales are unconfirmed; however it is thought that they belong to the Northern Isles Community that moves between Iceland and Scotland. The sightings reports and videos confirm that there is one bull, as well as at least three females, and a young animal. See here for an amazing video of a young pod member surfacing next to Western Ferries, by Lindsay Moss. “These sightings are really rare. To put it into perspective, since HWDT started collating community sightings more than a decade ago, there have been less than a handful of orca whale encounters reported in and around the Clyde”, explains Pippa, HWDT’s Community Engagement Manager. Although killer whales come into contact with humans relatively frequently, it is important to remember that this area can be a busy and noisy environment for these animals, especially with a young animal in the group. Therefore, HWDT would encourage boat owners to enjoy encounters with these majestic creatures from a distance and be extra cautious, in order to provide them with the space then need to navigate, rest and hunt. More advice on how to act around wildlife to avoid unintentional disturbance or harm can be found in the Scottish Marine Wildlife Watching Code, available here. Please note, if you do see any unusual behaviour from the pod, or have any concerns, please contact the British Divers Marine Life Rescue on their out of hours number at 07787 433412.